Please join us on Saturday, February 9 from 6 to 9pm to celebrate the opening of our winter exhibitions, Over, Under, Forward, Back and Convergence: Works by AAC's Resident Artists. Please join us on Saturday, February 9 from 6 to 9pm to celebrate the opening of our winter exhibitions, Over, Under, Forward, Back and Convergence: Works by AAC’s Resident Artists. Engage with artists from both exhibitions and visit our residents during their open studio hours. 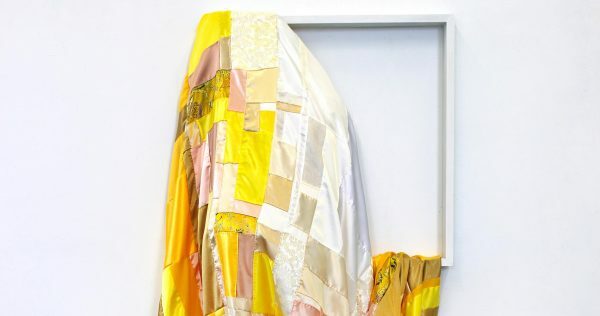 Whether working with yarn, thread, found fabric, recycled clothing, fishing line, or plastic netting, contemporary artists working in fibers, textiles, and related traditions utilize materials that are also ubiquitous in daily life. From the circulation of commercial textile and fabric goods, such as clothing, to diverse traditions of hand-making, often coded as women’s work, fibers-based media and the techniques for manipulating them are tied to history, to economics, to community, and to family tradition. These connections have inspired and attracted the artists of Over, Under, Forward, Back, who embrace the techniques of the past, experiment with new means of production, utilize non-traditional materials, and mine their own personal and family histories for connections to their work. Participating artists: April Camlin, Steven Frost, Rania Hassan, Sarah J. Hull, Robin Kang, Julia Kwon, Olivia Tripp Morrow, Natalia Nakazawa, Danni O’Brien, and Sarah Stefana Smith. Featuring a diverse selection of works by AAC’s twelve resident artists, Convergence examines the current trajectories of these artists, while surveying the collective output of AAC’s creative community. Reflecting the creative dialogue that characterizes AAC’s residency program, this exhibition presents work in a broad array of media, from sculptural assemblage to photographs to paintings. Despite the multiplicity of approaches, the works are connected by a shared interest in time and memory, personal and cultural history, and material transformation. From sculptural works based on memories of the urban landscape, to photographs exploring absence and presence, to paintings addressing cultural appropriation, this exhibit offers an overview of the processes and themes embraced by AAC’s talented artistic community. Featured artists include AAC’s ten long-term and two short-term resident artists: Negar Ahkami, Michèle Colburn, Roxana Alger Geffen, Sarah Hardesty, Stephanie Lane, Marissa Long, Ryan McCoy, Olivia Tripp Morrow, Jen Noone, Jung Min Park, Austin Shull, and Dawn Whitmore. Bmoreart is a creative and critical daily online journal. We believe that Baltimore's creative class deserves to be discussed, critiqued, and well-informed. Click here for Advertising Inquiries.